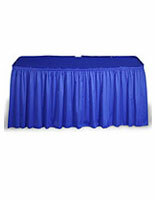 This All-in-One Table Skirt Sells in a Variety of Colors and Sizes! 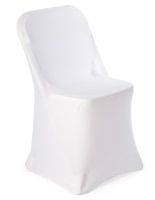 Dress Up Beat Tables at Your Next Banquet Dinner or Award Ceremony! Purchase This Stylish Table Skirt with Accessories for Less! 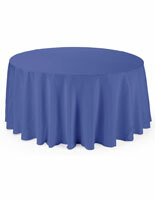 This top quality table skirt is ideal for all your hotel, restaurant, retail, or trade show needs. 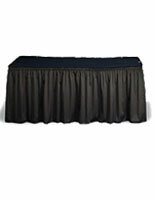 This skirting is designed to outfit 8' x 30" tables. 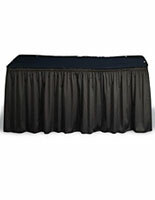 The table skirt kit includes the skirting, matching topper, and clips for 3/4" or 1-3/4" edges. The unit wraps all the way around the edges of an 8 foot surface with no gaps. The table skirt falls within 1" of the floor on all sides. 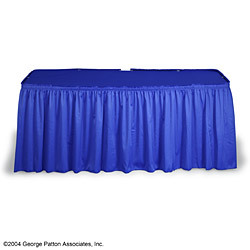 The polyester fabric is very durable and flame retardant. In addition, all orders are shipped with flame retardant certificates from an independent testing laboratory. 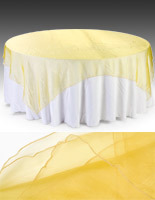 The table skirt is also machine washable and dryable. 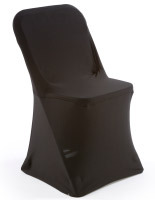 Competitive options may appear cheaper initially; however, most packages do not include the table topper or clips in the price, so shoppers must buy them separately. Our company bundles the skirt, topper, and clips in one easy to order package. The skirting measures 21-1/2' long and is 29" tall. 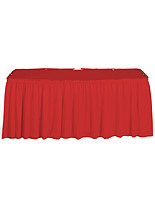 The tablecloth measure 9' x 42".